My 7 year old son recently did his show and tell and the topic was “forces”. Being interested in locks he chose to explain to his classmates what’s inside door locks. It got me thinking that despite the fact we all use locks on a daily basis it is possible that many people don’t know how locks work! So inspired by my son’s show and tell I thought I’d shed some light on the question subject; How does a lock work?. 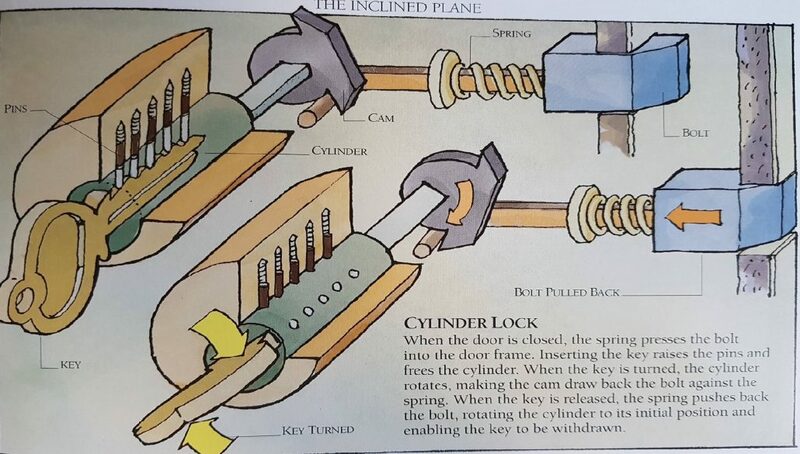 Perhaps understanding how these locks work will help you understand, to some degree, what it is you are paying for when you call a locksmith. Many people refer to these as Yale locks. 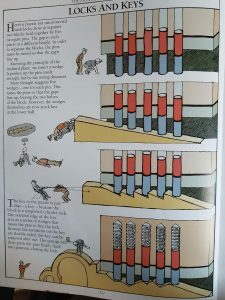 There is also quite a good diagram on this site, in the section called How Do Yale Locks Work, showing how the pins line up when the key is inserted. The key (to match the particular lock) lifts the pins to the correct height to allow the latch (the part that protrudes into the door frame) to be pulled back against the spring allowing the door to open. Once the key is removed the spring will automatically push the latch back out. Unlike most lever locks a cylinder lock can lock automatically when the door is pushed or slammed shut. This is convenient but can make cylinder locks less secure than lever locks. This is why it is important to have both a cylinder and a lever lock on your door. Here you can watch a really good animation that shows how a cylinder lock works. This video shows the workings of an actual lock in action. These are commonly known as Chubb Locks. They work much in the same way as cylinder locks but instead of pins and a spring a series of levers must be lifted to enable the bolt to move in or out of the door frame. See the image below. 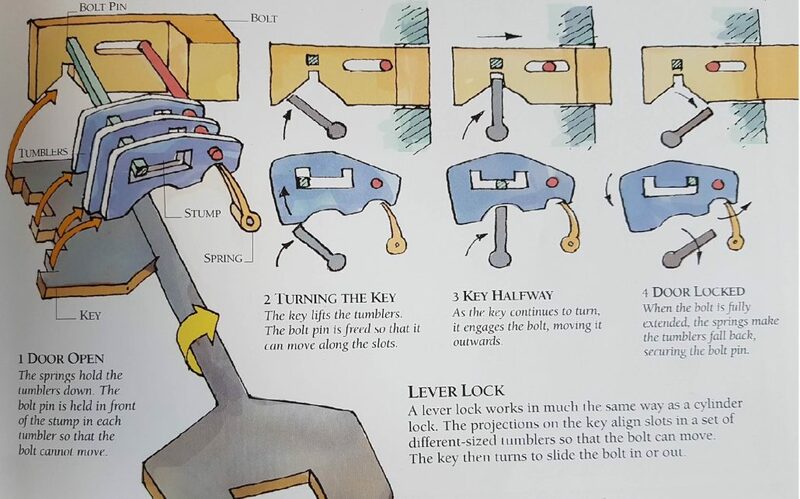 If you would like to see an animation of the workings of a Lever Lock watch this video. The fact the lever locks can be both locked and unlocked with a key makes them more secure. What If I Don’t Lock My Lever Lock? It is crucial that you always lock your lever lock (Chubb lock) even if you are only popping out for 10 minutes. Without the use of this lock, not only are you making it much easier for intruders to access your property, your insurance won’t pay out if you have been burgled! Most insurance policies require a 5 lever deadlock to be used and if it has not been locked you can kiss goodbye to your insurance claim. Start Locking You Lever Lock Today! If you don’t lock your lever lock you are not in the minority. Unfortunately many people I come across in my job and outside work aren’t in the habit of locking their deadlock. If you can relate then it is time to make a change and form a new habit. It is so important! If you do it for a week it will become second nature. My hope is that with some understanding of how these locks work people will think twice about leaving their deadlocks unlocked. For a lot of people it takes a break in to highlight the importance. Don’t let this be you! The Correct Lever Lock – A Security Must! Make sure you have a lever lock on your door which is 5 lever and conforms to BS3621. This is the lock that you need to have for both security and insurance purposes. If you are in North London and you don’t have a lever lock or have the wrong type of lever lock on your door or are unsure if it meets the standards required….. I can’t stress enough what a security priority it is. I hope you have found this post on how a lock works interesting. Maybe you already knew how your locks worked? If not I hope this has been informative. Soon I will write a post explaining what is involved in changing both these lock types. I am sometimes asked “Should you change a door lock yourself?” Read here for the answer to that question.